Hey, Drawgerites! Sorry I haven't been around here much. So much to do, so many new faces here in Drawgerland, so little time. Hard to keep up. I did notice a bit of monkey business going on in my absence & thought you should know about a little known monkey animation. 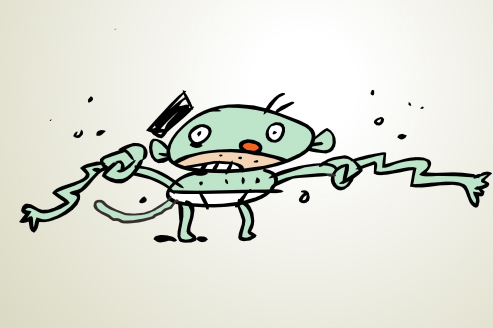 There is, of course, the infamous Green Monkey animation on my website, but I created this one sometime back when the vector program I most often use, Toon Boom Studio, created their version specifically for a Mac. Wanting to try it out, i whipped up a quick animation using my favorite character, Green Monkey and slapped together a soundtrack in GarageBand. It should take you to my YouTube page. Monkey is waiting for you.